Happy Easter everyone! I hope you've been having a lovely long weekend, enjoying the festivities and, obviously, eating lots of chocolate eggs. 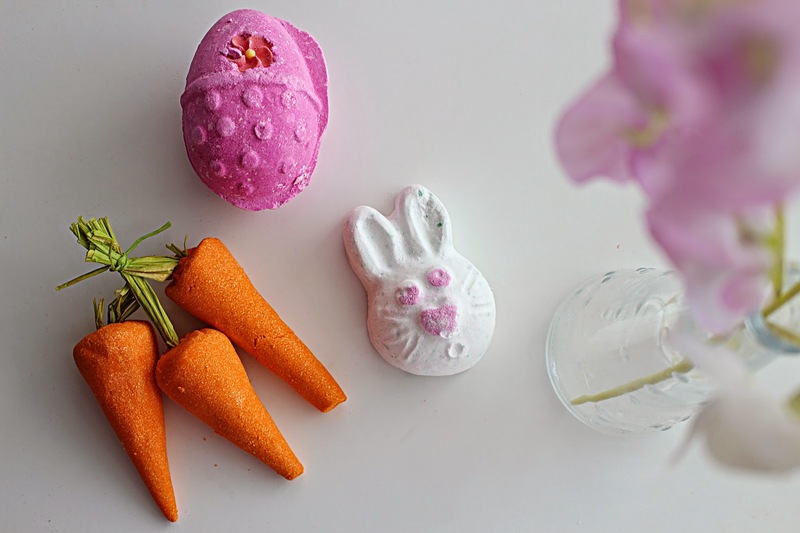 Of course, Easter wouldn't be Easter without an adorable range of products from Lush's Easter collection, and this year certainly didn't disappoint. With a nice big selection of spring-like, Easter-themed goodies, Lush have delivered yet another fantastic range, and one I'm a huge fan of. I was sent a few goodies from the collection to try and thought I'd run through and fill you in on what these look and smell like! First up, a really popular product has got to be the Hoppity Poppity bath bomb*. Shaped like the most adorable rabbit ever, this fizzy bath bomb contains popping candy (hence the name) to make for a really fun bath. It has quite a herby scent and is ideal for pre-bedtime baths as it contains lavender - perfect for sending even the most difficult snoozers to sleep. It also contains lime oil and violet leaf. Gorgeous! One of my personal favourites, the classic Fluffy Egg bath bomb* is filled with the incredible Snow Fairy scent that fans of sweet scents will absolutely adore. A must for pink lovers, this egg fills your bath with a candy pink colour and has all the sweetness of candy without the calories! I wish they did this bad boy all year round. Finally, the Bunch of Carrots bubble bars* are a fantastic quirky treat for swirling around your bath tub to add some much-needed bubbles and have the gorgeous uplifting and zesty scent of buchu, lemon and grapefruit oils - ideal for those early-morning bathers in need of a wake-up call! I really love this bubble bar if I ever feel like I need a pick-me-up, and you have to admit the little carrots look adorable sitting by the bath tub! Other fab products worth mentioning from the range include the blingtastic Golden Egg bath bomb melt, the Somewhere Over the Rainbow soap and Immaculate Eggception Pink bath bomb. I need them all! Have you been enjoying Lush's Easter collection? Let me know which are your favourites!